Respawn's FPS sequel makes a strong first impression. Titanfall 2’s grappling hook is my new favourite toy. Available with the game’s Front Rifleman class, it attaches to any surface in the level, and when combined with the multiplayer shooter’s trademark wall-running and jet pack, the sense of momentum feels fantastic. In the Boomtown map showed at EA’s Play event yesterday, I used it to pull between rooftops, yank enemies towards me and make fast escapes from stampeding robots. It’s the best I’ve ever seen that idea done in a game, and if you can think of a novel way to use it in Titanfall’s multiplayer arena shootouts, the chances are that Respawn is already two steps ahead and found a way to make it work. If you want to use the grappling hook to get on top of an enemy Titan, you can. If you want to beat an enemy to death in mid-air while zipping to another surface across the map, that’s possible too. In the finale of a lost match, where your team has to abandon the planet’s surface intact, you can attach it to the dropship in order to make an escape. It offers a more vivid Spider-Man-like experience than any game that actually stars the character—it’s terrific fun, yet it’s just one new ability in a sequel that’s kept the basics of the original but added many more novel ways to dominate the battlefield. The EA Play demo of Titanfall 2 has three classes in it: the aforementioned Front Rifleman, the heavier Hard Tracker and the Counter Sniper, the latter of which I waited to try last since it sounded the least exciting. I was wrong. While the sniper doesn’t have the grappling hook (neither does the tracker), they do have access to gravity stars, the gravity-shifting bombs seen during the game’s reveal trailer. These feel particularly nice when they clump a group of grunts together in a blue flash. The default sniper rifle, the new-to-the-series D2 Double Take, was surprisingly fierce in feel when I started picking off enemies, almost like the feedback of a shotgun. The grappling hook might be a hard tool to top, and it was the highlight of the demo, but each class has its own novel abilities to experiment with. That extends to the Titans this time too, which are more clearly defined ‘characters’ in a sort of MOBA vein rather than just alternate vehicle types. There were two on show at E3, the laser-focused Ion and the flame-throwing Scorch, and the website suggests there’ll be six in total. Each one has four different unique active abilities, as well as a couple of passive ones. Ion can fire a really neat and precise laser attack, which I smugly used to pick off one pilot leaping between rooftops in the distance, and its special ability is essentially a big mech version of Tony Stark’s chest laser attack from Iron Man. Meanwhile, Scorch has an AoE attack called Flame Core, which blasts the ground in front of you. Both of these super attacks take time to build up, and they add a noticeable peak to the excitement of controlling a titan, which otherwise feels familiar to how it did before. One slight issue I had with the demo is that the mode on show, Bounty Hunt, where players are tasked with hunting down targeted pilots, was a little confusing to follow as an introduction to the game - it took me a couple of games to get my head around it, as objectives and the centre of conflict kept shifting to different points on the map. It’s very playable and terrific fun, just as the original Titanfall was. But then I didn’t doubt that would be the case—across multiplayer and an under wraps single-player campaign, the team at Respawn are pioneers at building this stuff. My big question is longevity. Our experience on PC Gamer was that Titanfall was the ideal shooter to play for about 20 hours, but we weren’t still playing months later. I know a bunch of players who truly loved it, though, and never stopped—anecdotally, it just felt like it faded away a little faster than it maybe should have. The season pass, meanwhile, only made it harder to find a game on PC. Lessons have been learned, here: according to lead programmer Jon Shiring, there won’t be paid-for maps in this one, just free ones, which is wise and generous. 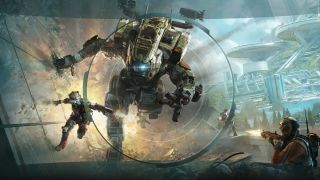 In addition, Respawn has also hired Todd Alderman, the brains behind Call of Duty 4’s genre-defining progression systems, to help fashion an as-yet unrevealed reason to keep people playing and give Titanfall a long lifespan. I felt like I used up the spectacle a little too fast in the first game—hopefully this is the key to keeping it installed a little longer. I really enjoyed this opening showing of Titanfall 2, so much so that I queued for it four times, and I can’t wait to see how that grappling hook can be put to use in other maps, or what other novel abilities are waiting to be shown off. There’s also the big question of exactly what that single-player campaign is: the first this team has made since 2009’s Modern Warfare 2. I came out of this demo excited about Titanfall again, about how empowering it makes you feel as a player when you nail its sense of movement. All the novel abilities Respawn is layering on top of that points towards a convincing follow-up.